Recycling is not only good for the environment, it is also good for the soul. And if you do it right, it could be good for the pocket as well. 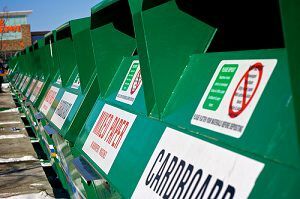 We all know that you can take your clothes to Goodwill, and that you can recycle your bottles, cardboard, newspapers and cans. But what about everything else? Here’s some ideas to get serious about recycling and reusing stuff that otherwise would have gone straight to the landfill. Consumer electronic goods are a growing problem for governments and industry, as electronic equipment contains toxic materials that should never find their way to landfills. Luckily individual companies like Sony and Nokia are stepping up to offer free recycling programs for their products to help with the problem. Techforward – Guarantees future trade-in values at the point of sale by reusing or recycling your easily returned devices. Gazelle – A smartly designed re-commerce service that helps you sell and recycle your used electronics. It’s estimated that a whopping 30 percent of our residential garbage stream is made up of food waste. But what can you do with your food waste other than put it in the garbage bin or down the disposal? If you like to garden, keeping a compost bin in the yard is an excellent place for your food waste. Think that living in an apartment keeps you from this option? Think again! Vermiculture uses red wiggle worms to turn your garbage into a nutrient rich soil additive. And you can even do it in a small space indoors. Some progressively minded municipalities are making the connection that it’s cheaper to recycle food waste than to use up valuable landfill space, plus the resulting compost can be sold as organic fertilizer for a profit. If you’re lucky enough to live in one of these cities, you can simply place your food waste on the curb along with your bottles and cans! Coffee grounds – a natural deodorizer, simply dry the coffee grounds in the oven, spread thin on a cookie sheet at 200 degrees, and then put it in a bowl in your fridge to absorb odors. Or fill old stockings to create a hanging sachet. Apple peels – stimulate your sourdough culture by placing peels on a perforated lid. Citrus rinds – place orange or lemon rinds in a bowl and keep near a heat source to freshen up your living space! Peanut shells – save up your spent peanut shells to place on the coals to add an extra smokiness to your next barbeque. Soaking them in water creates a slower burn and enhances the flavor! Bottom line, get creative and look at your refuse with reuse in mind! Don’t just toss usable items, consider contributing to the free-things ecosystem and give your junk a chance! You know what they say about one man’s trash… Craigslist and Freecyle are the most popular forums for passing along your unwanted goods. I’ve given away everything from microwaves to books on these forums, and picked up a few items along the way. I even painted my house interior with donated paint from an ad on freecycle. So the same goes for spending your hard-earned cash: before you whip out your wallet, take a peek at the ads to see if someone might be giving away the very thing you want! Another idea is to organize a FreeMeet in your community. FreeMeets bring together people who want to give stuff away, and possibly pick up items, too – a great way to capitalize on spring cleaning by fostering community and reuse. Affluent societies such as our own offer many opportunities to benefit from overconsumption, which often results in perfectly usable goods available free of cost. An entire subculture exists on this premise. Freegans are dedicated to “limited participation in the conventional economy” as a protest lifestyle. They strive to refrain from participation in an economy whose focus, in their view, is solely based on profit, while resources are often thoughtlessly wasted while many people on the planet lack basic necessities. While we can’t all be as extreme as Freegans, there’s certainly something to be said for more conscious consumption. By engaging in more ardent recycling, we can all help in our own small ways. What are your creative reuse strategies? I had no idea that you could make some money off recycling your electronics! Anyone have any ideas how much you can collect for doing that? well, we don’t have pick up recyclables where I live (in the city of Detroit), so we have to bring everything to a church once a month…we collect it in the garage. It’s pretty labor intensive, but this church takes everything but food! And my boyfriend is German, and recycling is very ingrained in him, so he keeps me honest! I only do some basic recycling such as segregating bio and non-bio garbages. Garbage Trucks collect the non-bio garbage every week. Then, I created a pit hole for our bio garbages.